Citizenfour certainly makes a pointed argument on the power of information and the weaponry of privacy and freedom. It’s ironic that Snowden’s plight rests with the America government being infuriated by the fact one of its citizens was spying on them because he didn’t like that they were spying on him, but this paradox is also philosophically self-evident from Snowden’s case. Ditto the other exhaustive documentaries that have already tackles breaches of privacy and information by Uncle Sam in the digital age—take Terms and Conditions May Apply or The Internet’s Own Boy—and use specific cases to lead to greater debates invited by the violations of one’s basic rights. One must laud the gumption and bravery of Poitras, Snowden, and reporter Glenn Greenwald, though, in taking such a risk to bring this story to such a wide audience. The testimony and evidence that Edward Snowden and, in turn, Citizenfour have to offer is vital information about the American government’s invasive privacy crimes, breaches of security, and total violation of public trust. Citizenfour is documentary democracy at its finest as Poitras and Snowden communicate like spies to avoid detection and rendezvous in hotels to dish the dirt on the NSA, the FBI, and President Obama, who might be the biggest letdown the American people have seen since Interstellar. If Citizenfour shows the democratic potential of documentary filmmaking in fine form, the film form of Citizenfour is far from the best that non-fiction cinema can be. Poitras and company take an enormous risk with Citizenfour and there is undeniable merit and valour in their investigative measures, but if one puts a mildly charismatic subject with streaks of paranoia in front of the camera and lets him spill government secrets, one is bound to have a decent film. What makes a good subject evolve into a great documentary is the way in which the filmmaker engages with the form to interrogate the subject and draw out the larger implications of the specific subject. Take, for example, Robert Greene’s Actress, which, in short, also sees a filmmaker receive remarkable access to a subject, but the observational qualities of the film showcase the performative aspects of Brandy Burre’s daily role as a mother and they situate her story within a league of countless forty-year-old actresses struggling to make a career out of their passion. Poitras, on the other hand, shows a negligible engagement with the elements of film form and the cinematic qualities that let documentaries exceed conventional journalism to engage and incite audiences to their fullest fury. Citizenfour is a formless blob of a documentary, albeit a very important one. Citizenfour, frankly, is almost wholly compromised by the circumstances of its production since much of the film consists of crudely shot interview sequences with minimal coverage in a hotel room. Some of the shots of Snowden speaking paranoid gobbledygook go on for minutes. This audio-visual transcript makes the viewer a third party in a hush-hush meeting, yet, despite the juicy details, Citizenfour brings audible fits of snoring into in theatre. (This statement is merely an observation based on the screening I attended and not an attempt at wit.) 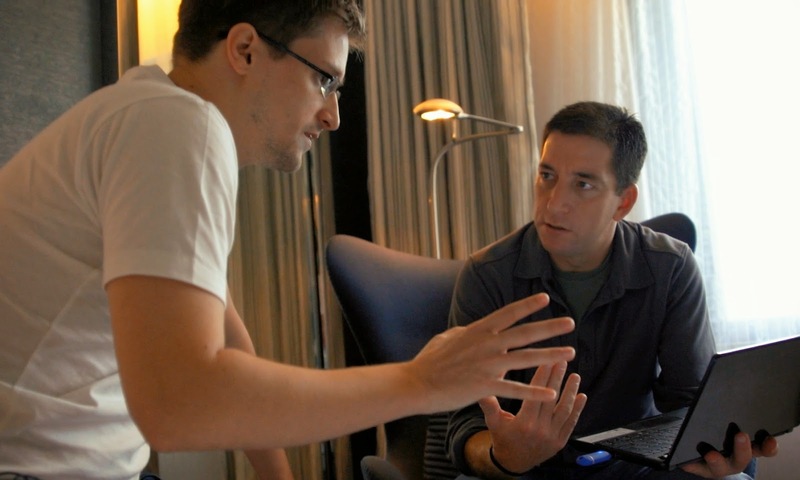 Given the circumstances, one can’t really fault Poitras for making such bland footage since her meetings with Snowden and Greenwald required a necessary cloak of secrecy, but there’s also very little work done in the post-production assemblage of Citizenfour—beyond a surprisingly overwrought score by Gone Girl composers Trent Reznor and Atticus Ross—to further the material beyond exposé. Therein sits the key problem with Citizenfour. Snowden’s story is over a year old. These facts and revelations about the American government are sensational revelations for June 2013, and one cannot deny that they remain relevant today, but Citizenfour offers very little about the leak beyond a first-hard account of the story’s genesis. I agree with every bit of philosophy behind Snowden’s choice to blow the whistle and I think that both his and Poitras risk offers an enormous service to the people, but one cannot conflate the newsworthiness of a film’s subject with the quality of the film itself. Snowden’s story probably makes a great read, especially if one goes back to Greenwald’s original article in The Guardian or Poitras’s co-authored scoop in the Washington Post. The source material behind these stories is undeniably interesting, so it’s too bad that Poitras fails to comment on the story that she herself broke or further it beyond old news. Citizenfour is now playing in Ottawa at Silvercity Gloucester. What do you think, doc fans: is a film as good as its subject, or does a good film require more?